Colchicum, Colchis, an ancient region on the Black Sea south of the Caucasus Mountains, now mostly the western part of Georgia, known to the Ancient Greeks by that name and mentioned in their mythology as the destination of the Argonauts and the place of Medea and the golden fleece. tunicatum, tunicate, having coats or envelopes or a thin seperable covering. סתוונית, Sitvanit from Stav (סתו) meaning autumn. The standard author abbreviation Feinbrun is used to indicate Naomi Feinbrun-Dothan (1900 – 1995), Israel botanist. Colchicum tunicatum is one of the first native geophytes to flower. 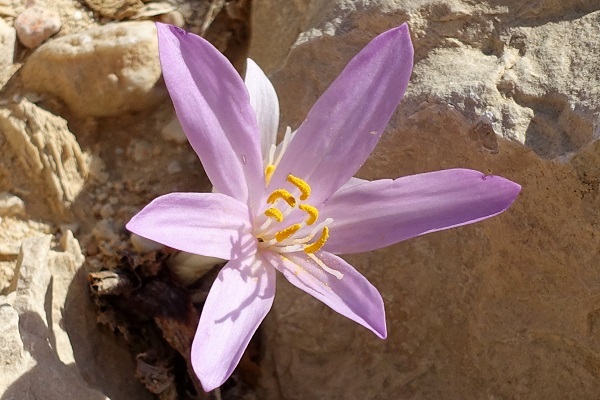 Colchicums have 3 styles and 6 stamens, while crocuses have 1 style and 3 stamens. In addition, the corm structures are quite different—in colchicum, the corm is irregular, while in crocuses, the corm is like a flattened ball. Crocus is in the Iris Family, Iridaceae. 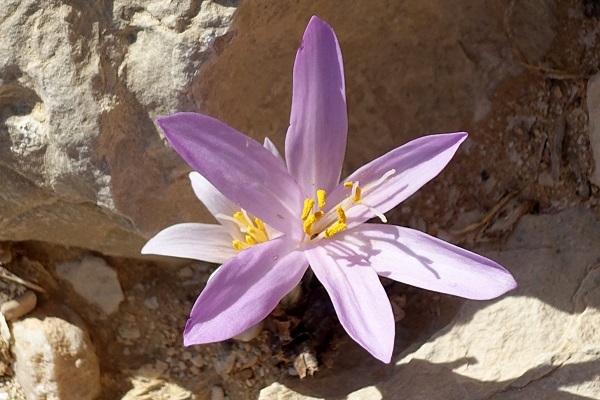 It is probable that colchicum was known to the early Greeks under the term Ephemeron "which some call Colchicon". It was first referred to, and as a poison, by Theophrastus, and followed by Dioscorides in the "Materia Medica" (Ist-2nd cent.CE. ), as it has come down to us in the "Julianae Aniciae Codex", transcribed before 512 CE. as a wedding present for the daughter of Anicius Olybrius, Emperor of the West (Born about 440 - Rome, Italy. Deceased 23 October 472 - Rome, Italy , age at death: possibly 32 years old), and now available in a photostat edition, speaks of "Ephemeron, which some call Colchicon", making the two terms synonymous. It then gives a description of a poison which could very well be the modern colchicum. "Some call the plant Colchicon, others call it Bolbos. The Romans call it Bulbus agrestis. As the autumn is drawing to a close, the plant puts forth a whitish flower, like the flower of the Crocus. Later it bears leaves somewhat like those of the Bulbus, but shinier. It has a stalk a span long and reddish seeds; its root has a tawny skin verging into black. When peeled, the root is found to be white, tender, full of juice, and sweet. The plant has its diaphysis at about its middle, from which point it sends forth its flower. The plant is found chiefly in Messenia and Colchis. When eaten, it has a fatal effect by choking, as is the case with mushrooms. We have described the plant so that no one may confuse it with the edible Bulbus and eat it by mistake. It has a strange attraction for the unwary because of its pleasant taste. To those who have eaten of the plant, drinking cow'smilk offers relief, as it does to those who have eaten poisonous mushrooms. Whenever there is cow's milk at hand, there is need of no other antidote."